Taste test: These are good narrow-rippled potato chips, and they live up to their name, as they are indeed crispier than most similar chips. The crunch is good, and the taste is very potatoey but not too salty. I dipped mine in some ketchup, and they tasted great. 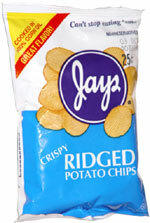 Smell test: Good potato chips smell.